Lauren and I spent a day cooking and taking food photographs with her sister Kaitlin (super cool sister) and Kaitlin's fiancee Ricky (super badass professional photographer). We started the day by going to the Cleveland West Side Market, then we moved on to an Asian supermarket. We spent 7 hours cooking, laughing, and taking photos. It was a total blast. While we were starting to get our ingredients and equipment organized, I whipped up a fast appetizer so people wouldn't get too hungry while we were cooking. If you haven’t tried Pecorino cheese with honey and walnuts yet, you may be skeptical. This is a traditional Italian preparation that takes advantage of the salty-sweet flavor combination. 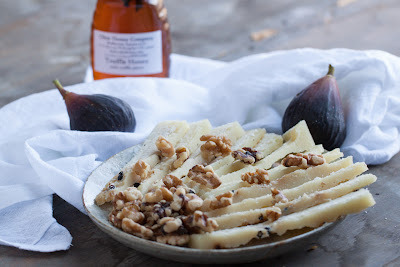 You can pair Pecorino with a variety of sweet items: figs, pears, honey, jelly/compote, grapes, etc. If you don’t like to cook, but you want to bring a fancy appetizer or cheese course to a dinner party, this is your ticket. 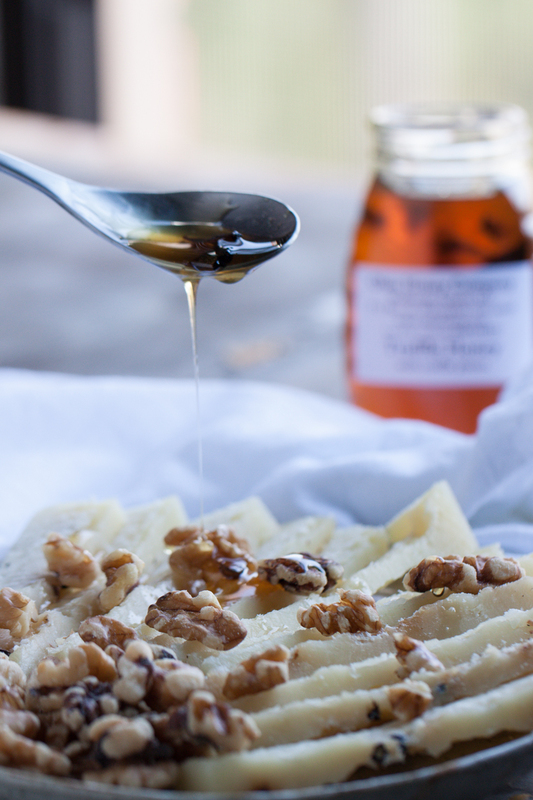 Cut the cheese (heh), sprinkle walnuts over it, and drizzle honey on top. That’s it! As you can imagine, since this is such a simple combination of items, the quality of the ingredients is key here. If you can, try to go to a nice cheese shop and ask someone about the different types of Pecorino. The more aged the cheese is, the stronger it will taste. I happened upon some truffle honey at the market, but you can use a nice quality regular honey as well. You’ll just miss the back end unmistakable funk of the truffles after you’ve taken a bite. There's really not much to say here. Slice the cheese in the way that you want to serve it. You can make little squares so people can eat it with toothpics, or longer slices for small plate presentation. Crumble some walnuts in your hands, and drizzle a good amount of honey on top. I always end up adding more than I would have guessed because the honey is so darn good.